Scarcity of water is a severe environmental restriction to plant productivity. Crop growth and yields are negatively affected by sub-optimal water supply due to physical damages, physiological disruptions, and biochemical changes. Here, we have reviewed the effects of water deficit stress on the germination and growth, water and nutrient relations, photosynthesis, and respiration in plants, particularly in maize. Oxidative stress is often associated as a secondary stress with primary drought stress. Therefore, injury caused by reactive oxygen species to biological macromolecules under drought stress is among the major deterrents to growth. 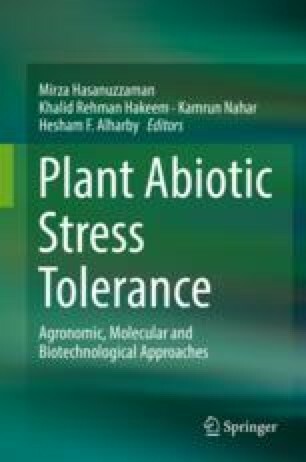 This chapter also describes the mechanism of drought resistance in plants on a morphological, physiological, and molecular basis. Plants display a range of mechanisms to withstand drought stress, such as deep root systems for enhanced water uptake, and smaller and succulent leaves to reduce the transpirational loss. Among the nutrients, potassium ions help in osmotic adjustment; silicon increases root endodermal silicification and improves the cell water balance. Low-molecular-weight osmolytes such as glycine betaine and proline have optimistic effects on membrane integrity and enzyme along with adaptive roles in mediating osmotic adjustment under drought. Plant growth regulators such as cytokinin, abscisic acid, and jasmonic acid induce several cellular mechanisms associated with drought resistance. At molecular levels, up- and downregulation of many drought-responsive genes and transcription factors have been characterized, such as the genes encoding for late embryogenesis abundant (LEA) proteins, dehydration responsive element binding proteins, and aquaporins. The development of crop varieties with increased tolerance to drought, both by conventional breeding methods and by genetic engineering, is an important approach to meet up global food demands with less water.